Of all the tasty little meze dishes that have passed through my kitchen in recent weeks—and oh, there have been many—this muhammara is certainly our favorite. It’s a thick, rich, flavorful paste of roasted red peppers and walnuts, spicy with harissa and just a touch exotic with the sweet-tart, unplaceable flavor of pomegranate molasses. Watch around the table: the first bite prompts a moment’s confusion, a second take, another bite, a smile. “What IS this?” It’s muhammara. There it is, just to the left of the spinach salad. (The recipe below makes twice the amount shown, so you may want to halve the recipe if you’ll be serving it with a good selection of other dishes.) A recent introduction to the dish at a local restaurant sent me down the rabbit hole of the many Middle Eastern variations of the dish, which of course reminded me to make hummus and find a few other little things to serve alongside the two, like little salads and harissa and bulgur with chickpeas and lemony tahini and pickled things. As if Jerusalem weren’t inspiration enough, I’ve been reading my way through Claudia Roden’s books and marking page after page, so you can see how I’ve been too busy cooking and eating to write. Do you have recommendations for my meze spread? And, yes, okay, I know you want to know about that spinach salad up there. It’s my version of this one. This one. This one. We love it. You will too. Muhammara (adapted from The Book of Jewish Food by Claudia Roden): In your food processor, combine all of the ingredients: 4 roasted and peeled red peppers (I confess to having used a 12-ounce jar), 1-2 Tbsp. harissa paste (to taste, and depending on how hot your harissa is), 2 toasted slices of whole wheat bread, torn into chunks, 1 1/2 c. shelled walnuts, 2 pressed garlic cloves, 3 Tbsp. pomegranate molasses, the juice of a lemon, 1 tsp. sugar, 1/2 tsp. salt, and 1/2 c. olive oil. Pulse a few times, then blend to a coarse paste, leaving a bit of chunky texture. This entry was posted in Middle Eastern Flavors, Snacks and Apps, Vegan or Would-Be-Just-As-Good-Vegan and tagged meze, Middle Eastern, pomegranate molasses, red peppers, vegan, vegetarian, walnuts on February 2, 2013 by emmycooks. Oh wow. I’ve never heard of this, but it sounds phenomenal. It seems like it would hit about the same spot as charoset (which I also love, and only get to eat at Passover). What would you recommend serving this with? Delicious! Do you have Roden’s Arabesque? I don’t use it often enough, but it’s a wonderful cookbook. No, but at my cookbook club tonight people were also singing the praises of Arabesque. Sounds like it needs to go on my library list! Claudia Roden is just marvelous – The Book of Jewish Food is one of my favorite go-to books. Muhammara is indeed wonderful! Your spread of dips and salads sounds incredible…your kitchen certainly is a delicious place to spend time in. It’s going on my library list, thank you! And I hear that pomegranate molasses makes an excellent cocktail with vodka if you need to get through yours quickly. Looks incredible, Emmy! I have to start cracking on the Ottolenghi book myself. Just got dried chickpeas today. Did you see the Smitten Kitchen “improvement” on his recipe? It requires removing all the skins from the chickpeas before puréeing. Totally labor intensive, but I bet it works like a silky smooth dream. As for other meze recommendations? Baba ghanoush or equivalent eggplant spread. Cacik or equivalent yogurt spread. Labne with sumac, feta-stuffed cherry tomatoes, carrot and cumin salad. I’m just trying to think what I like on my platter. That is awesome! Sounds like you had a wonderful and delicious game. I was at my grandpa’s American Legion Chinese New Year’s dinner wondering how a bunch of vets could have chosen to schedule a banquet during the Superbowl. Who does that?! I am fascinated by the pomegranate molasses. I’ve never heard of it and it sounds like it could make for some really interesting baking. This dish sounds fantastic and I am now craving a Middle Eastern extravaganza. Emmy this looks incredible. I’m intrigued by the recipe – so many familiar ingredients in such a new combination. I think I can make it tonight! Yum. We are partial to crunchy flatbreads with our hummus etc spreads – also, crisp matchsticks of jicama, not traditional but really nice. Maybe even dipped in muhammar a – yum!! Mmmmmmmmmmmm — this post makes my stomach growl. 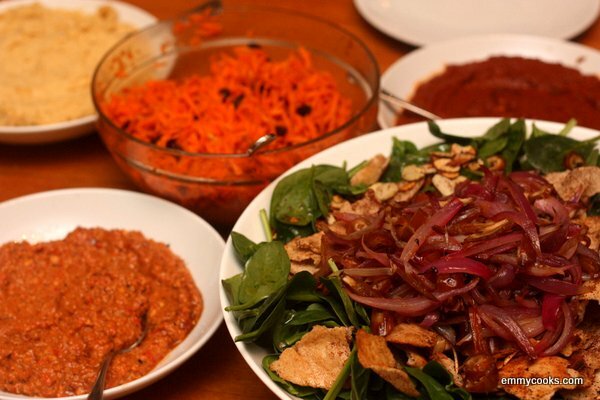 I want a big spoonful of muhammara alongside… well, just about anything on your table! Glad to see the recipe is rather simple and makes a lot. Thanks for sharing!